Portable DVD Player With Wireless Headphones | OhGizmo! While I don’t mind the occasional trips where I have to share my iPod with another listener I really hate when the cords get completely tangled or when the other person decides to move and ends up ripping the headphones out of my ears. So I really like the idea behind this portable DVD player from Hammacher Schlemmer even if I have little faith in the resulting sound quality. It uses a built-in FM transmitter to wirelessly transmit the audio from the player to a pair of included wireless headphones so besides not having to worry about packing that splitter cable you can also avoid that web of criss-crossed wires. The DVD player itself is pretty basic supporting both DVD and CD formats with a 960×336 LCD screen, built-in speakers and a 3 hour rechargeable lithium battery. The headphones which are probably as far from studio reference as you can get each require 2 AA batteries but have padded ear cups and an adjustable headband. 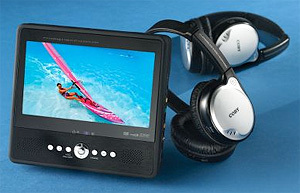 The Dual Wireless Headphone Portable DVD Player is available from Hammacher Schlemmer for $199.95. Hmm. That’s a very useful gadget. Nothing new of course. But still very useful.